As there are five Mondays in July the choice of style for the challenge at House of Cards has been left to us so in my 'using it up' mode I went ahead and made a card with some of the bits and pieces I had left in the colour scheme for July - wrong!! That should teach me not to make a challenge card until the post has actually been publlished with full details!! We've been given a photograph as inspiration for this final free choice week so I had to get my thinking cap on to make something else. The link to the photograph is somewhat tenuous because I've just used the colour of the wallpaper for the flowers on this classic style card. 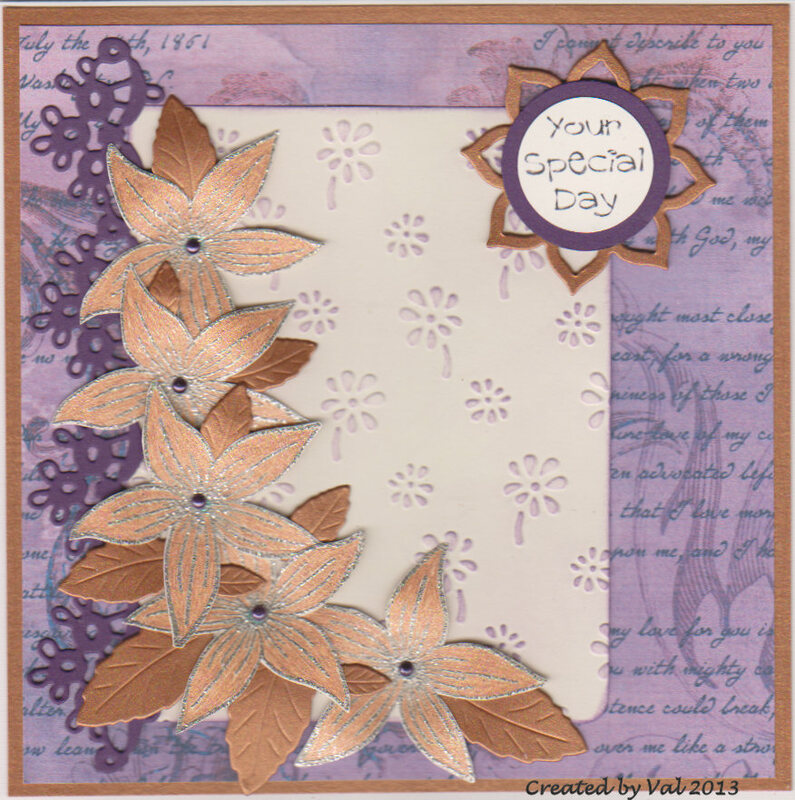 During my sort out of the working space I came across a page of stamped and embossed flowers which needed colouring so I used a Sakura stardust pen and then cut them out, adding some coppery leaves (Memory Box die). The background paper was left from a sheet I printed to use yesterday and the die cut strip and embossed panel were from the 'bits' box. A computer sentiment on punched and die cut shapes completes this card. Love or backing paper did you do this in CA? The back of the chair also echoes the appearance of your layered sentiment so with your copper leaves plus coloured flowers the link is there. I'm intrigued by how you're using up your scraps so effectively. Thank you so much for playing along with us at House of Cards. I love your card. Come play again soon. Hugs. Wonderful, this gorgeous rain of flowers! I like your color combo and the border punch on the edge is absolutly fabulous! A really nice card. Thanks for playing with us at House of Cards for our "Photo Inspiration" challenge! What a great way to use up some of your scraps from yesterday. 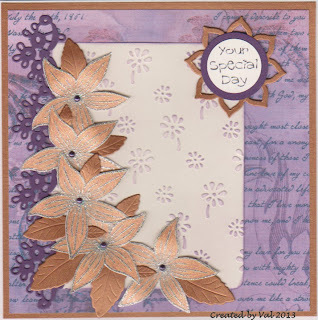 Love the coppery, shimmery flowers! Thanks for joining in our challenge this week and hope to see you again soon. Pretty silver embossed flowers~ Thanks for the joining in at HOC! lovely card! Those shiny embossed flowers look great! Thanks for joining us at House of Cards this week!